Cinnamon Cafe rests on Winter Road and despite despising cinnamon, I cannot hate this lovely little eatery. A girl in my class at university called Giada recommended it to me and I’m very grateful she did. Wedged between an Indian takeaway and an abandoned shop, it looks pristine and welcoming from the outside. Cinnamon Cafe has a grey shop front with a large window and, at this festive time of the year, had stockings hanging from the ceiling and fake frost. I peered inside. It was light and warm so I entered and momentarily escaped the winter chill. The interior is even more welcoming than the outside and the decorator really knows their stuff. It’s clean and open with several tables and chairs and a yellow and grey colour scheme which really brightens up the place. By the window was some counter seats so you could peer out and people-watch and around the edges were sofas to sink into and relax. On the wall was a large mirror clock and at the back was a Christmas tree ordained in lights and blue and silver baubles. I took my seat next to it and read the menu. They had a lot of choices and some interesting ones too that I have not seen anywhere else before. They had both breakfast and lunch options including a smoked salmon bagel, pancakes, mixed bean salad, tortilla pizza and a fillet of salmon with boiled egg and potatoes. They also had sandwiches, paninis and jackets as well as an extensive range of vegetarian food. These included pear and cinnamon protein pancakes, a banana and honey bagel and cumin-infused roasted vegetables with a scrambled egg. They all looked delicious and I was impressed by not only the range choice and uniqueness but also the price. Most options cost around £5.50 and the most expensive item costs £7.95 which is the chicken burger. For vegetarian friendly food with lots of ingredients, I thought this was very good. This opinion of mine was solidified when I saw the portion sizes. 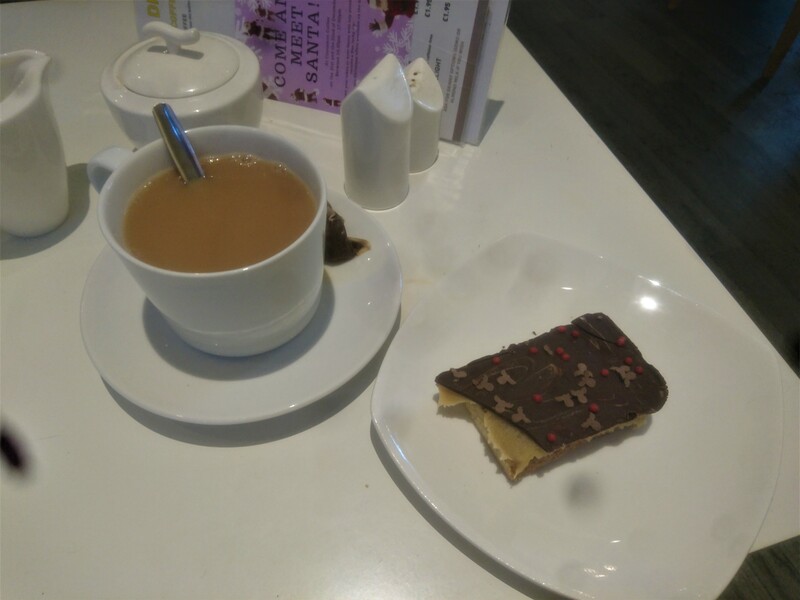 I approached the till and ordered a tea, toasted breakfast panini and a caramel shortcake. They had a few other cakes on display such as protein balls and a Victorian sponge and I noticed that their drinks menu was just like the food – extensive. Not only did they have teas and coffees and hot chocolates but also hazelnut, caramel and vanilla lattes, herbal teas, smoothies, protein shakes and a thing called a torpedo coffee with butter and coconut oil. The smoothies looked lovely, especially so for only £3 – £4, and I was glad to finally find a place that sells white hot chocolates in Portsmouth. Trust me. They are the drink equivalent of a unicorn in these parts. As I paid up I asked what time breakfast was until and the waitress said something that made my day – ‘all day.’ So, next time I’m hungover and have woken up at 2 pm, I know where to come for a bacon sandwich. Anyway, I sat myself down and relaxed and just before I went to tuck into my cake, my food was given to me. 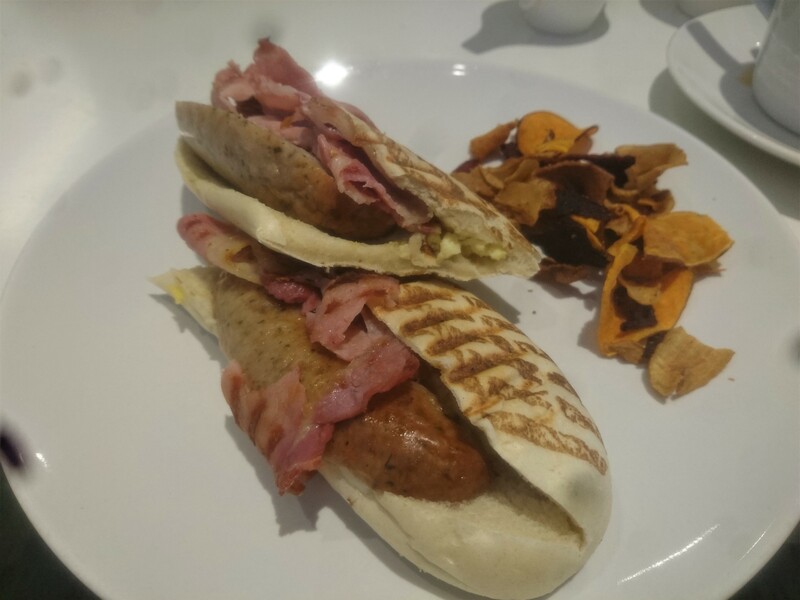 Shocked and impressed, I ogled my breakfast panini which had scrambled egg, sausage and bacon in. I thanked her and began my feast. Now, this was good. The panini was both soft and crunchy and had the right balance of the two. The filling was generous and burst with several strips of bacon, thick sausages and a big serving of egg. The sausages were tasty and fragrant and the bacon was not dried out or too crispy like most places serve. And, on the side was a handful of sweet potato chips that were salty and sweet. They were a nice touch. It was lovely but half way through I was already full. So, I had to leave it what was left, otherwise there would be no room for my shortcake. 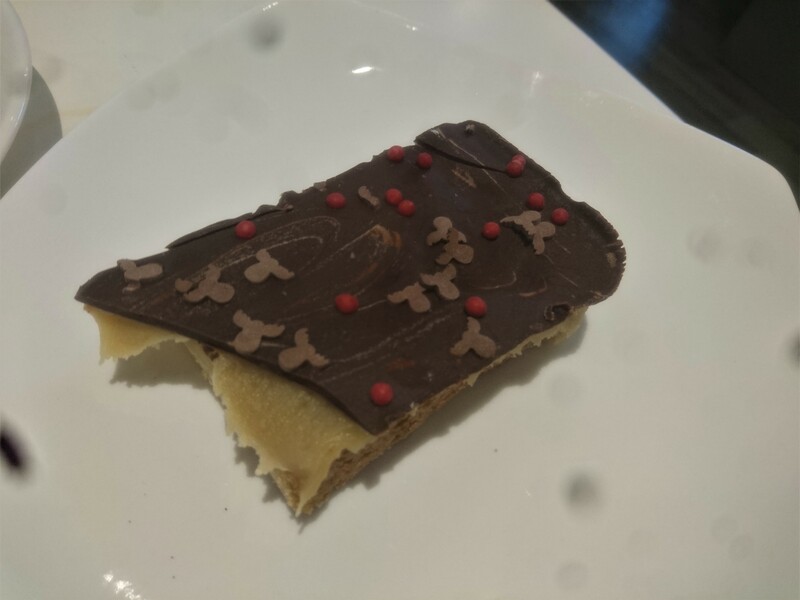 The caramel shortcake was a thick slab and had reindeer sprinkles on top which I thought was very cute. It wasn’t the best I have had in Portsmouth as that title still belongs to Parade Tea Rooms, but it was still tasty and rich. The base was crumbly and the chocolate had a nice crack and flavour. I couldn’t eat much more so I wrapped it in a napkin and smuggled it away. Before I left I ordered one last thing. I had been seduced by the smoothies the whole time being there and I finally caved. I asked the woman whether I could take it away and have it without cinnamon and she said yes to both. I then asked which one is the best and she said the ‘fibre bomb’ which had banana, kale, apple, mango and apple yogurt, mixed seeds, cinnamon and ice. Although mine didn’t have cinnamon as, like I said, I despise the stuff. 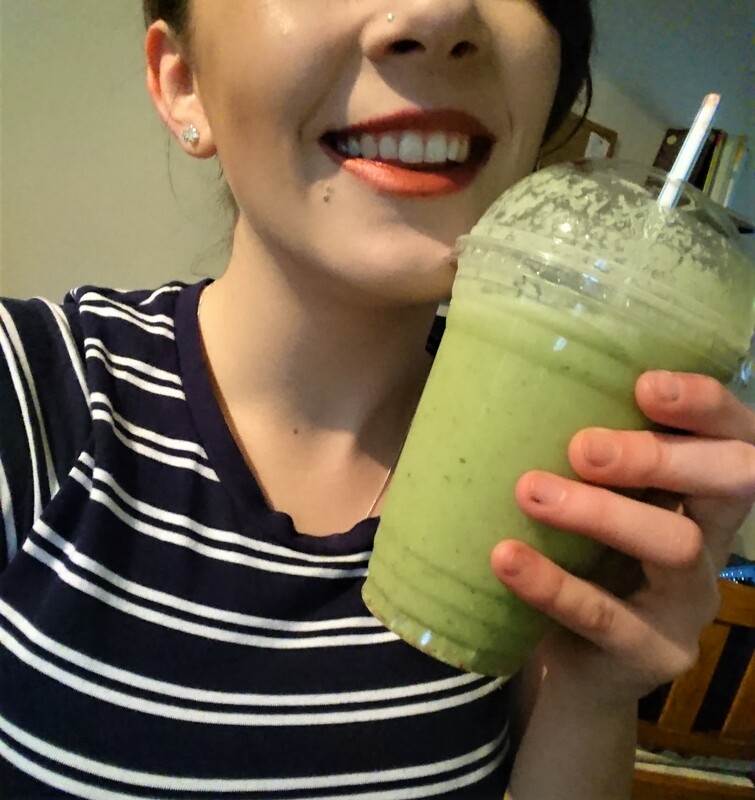 She made it for me within minutes and handed me this huge green cup with a straw. She gave me a large smile and wished me well. I slurped on this on my way home and it was the perfect way to send me off. It was cool and refreshing and slightly sweet too. So to anyone who is a vegetarian, wants breakfast all day and tasty, healthy food you can’t get anywhere else, then head down to Cinnamon Cafe. And, whilst you do that, I’ll keep thanking my friend Giada for recommending it to me.